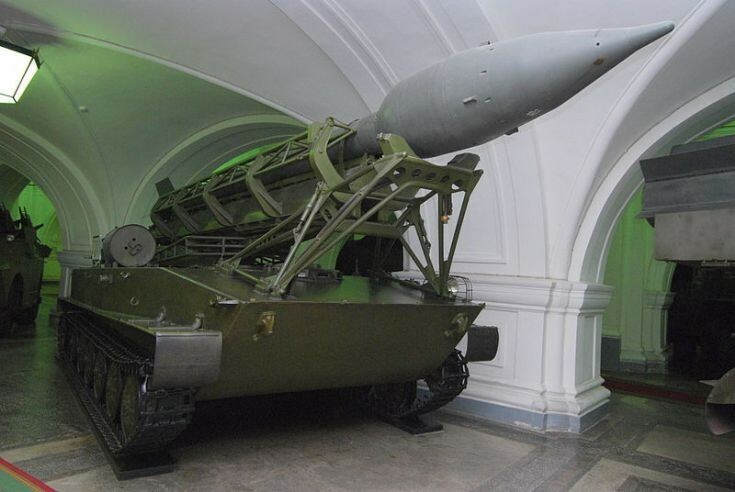 2P2 Transporter-Erector-Launcher with 3R1 missile of 2K1 missile complex «Mars» in Saint Petersburg Artillery museum. Janes states : The single-rail Filin (NATO designation Free Rocket Over Ground ,FROG-1) was carried on a modified IS-2 heavy tank chassis designated the 2P2. The shorter-range single-rail Mars (NATO designation FROG-2) was carried on the 2P4 non-amphibious variant of the PT-76 light amphibious tank chassis. Can anyone help us out? I would say that the base vehicle in this image is a PT-76 rather than an IS-2. Maybe someone with more experience of Warsaw Pact AFV's could comment further. Added by Stephen Prosser on 20 January 2014. I concur, the chassis is from the PT-76 series of vehicles. Added by Roger Greenaway on 22 January 2014. 2P2 Pion ( S-119A ) mounting, 3R1 rocket, 3K1 Mars tactical rocket complex or FROG-2. Added by Gary Hutton on 03 February 2018.